Lysos is a typical Cyprus village set amongst the mountains of Paphos Forest. A quick drive through tranquil countryside takes you to the vibrant town of Polis with many shops, bars and restaurants, and also to Latchi famous for its beaches and watersports.The Lysos area is well known for its scenic views, adventurous mountain biking and walking trails, horse riding and exotic wildlife, whilst at the same time being the ideal place for a peaceful sunshine holiday. 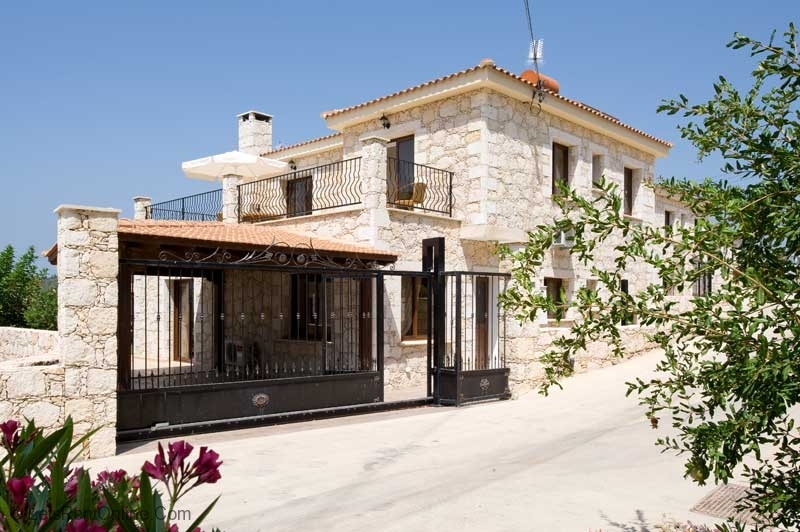 Villa Agios Georgios in Lysos is an impressive stone built three bedroom (all en-suite), three bathroom detached Cyprus holiday villa with an infinity private pool. 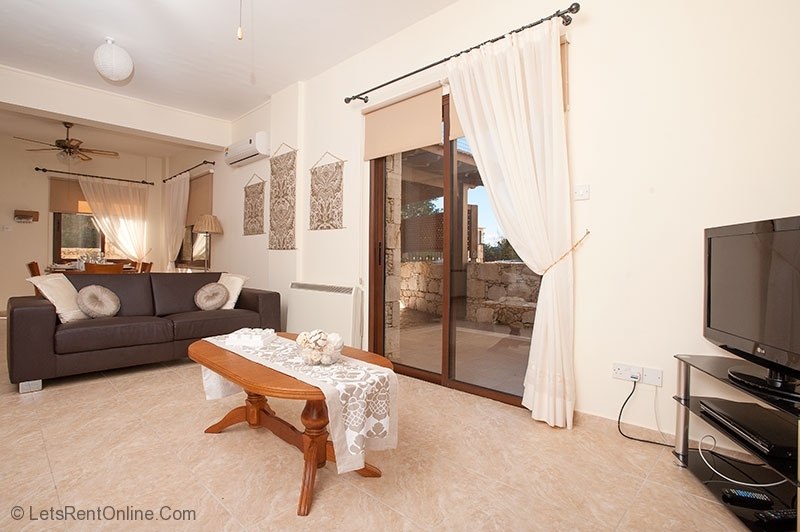 It has been designed, furnished and landscaped to the highest standards and creates a unique opportunity to have a real taste of traditional Cyprus village life as well as all the modern comforts of home. 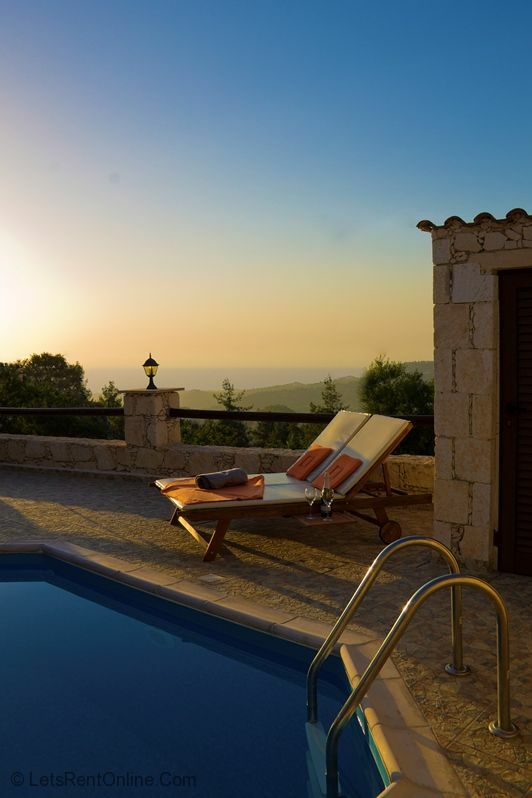 Enjoy relaxing on a sun lounger by the private pool, alfresco dining on the terrace and your favourite aperitif on one of the balconies as the sun sets over the mountainside and clear blue waters of the Mediterranean Sea at Polis and Latchi. 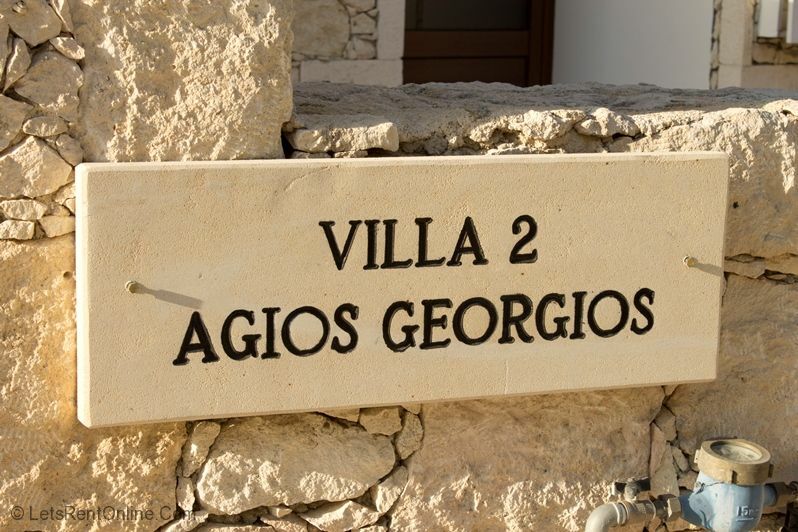 First impressions of Villa Agios Georgios in Lysos are the thought and care that has gone in to make the villa a true home from home. 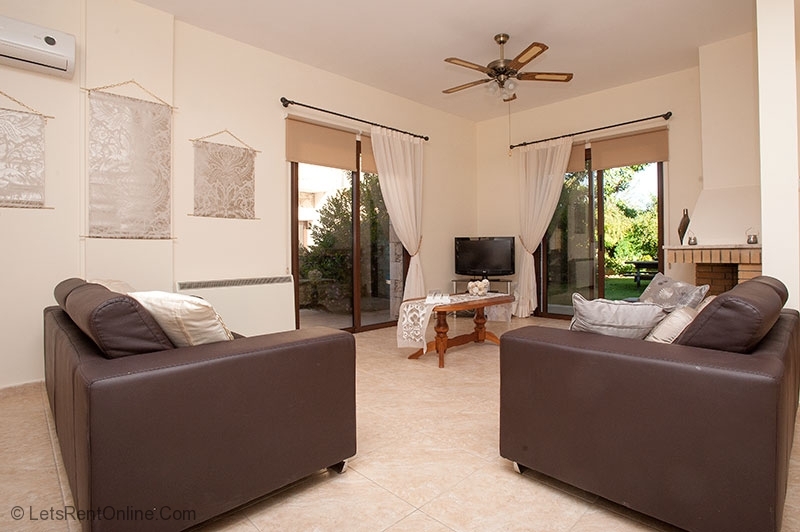 The villa's front door opens into a large airy open plan space comprising the lounge and dining area.The lounge is furnished with beautiful large real leather sofas and has a 36" Plasma TV with DVD player. Doors from the lounge open out onto the beautifully kept enclosed garden and private pool.The adjacent dining/breakfasting area is equipped with a wood topped table and six chairs. 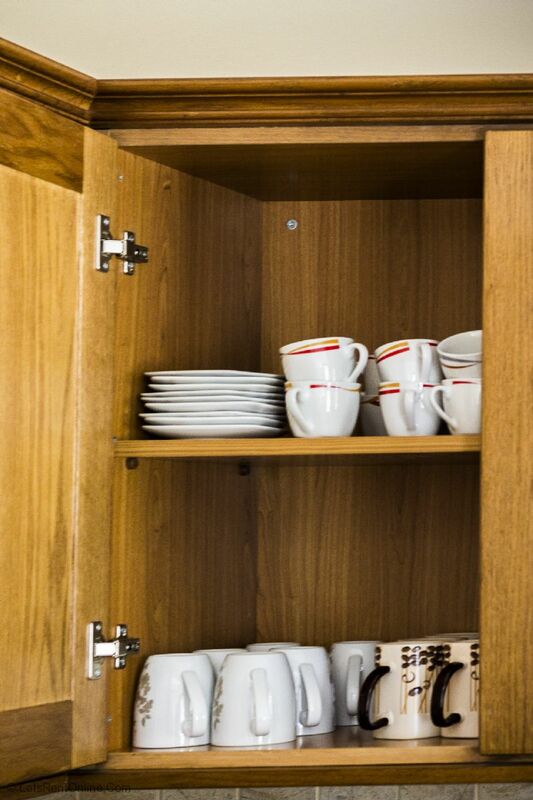 This area leads on to the fully equipped kitchen with all modern appliances including dishwasher, and coffee maker as convenient extras. 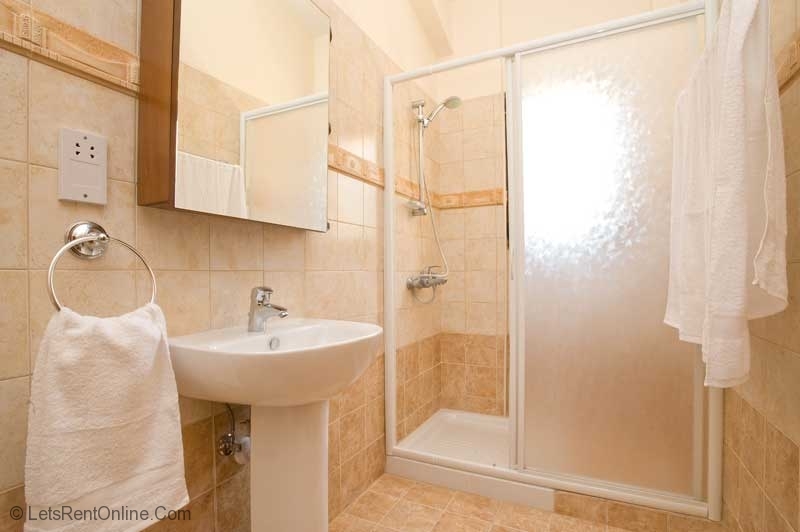 An additional utility area incorporates a washing machine.Making up the ground floor is a large double bedroom with king-sized bed and an adjacent shower room with large cubicle. Doors from the bedroom open out onto the enclosed garden and private pool. 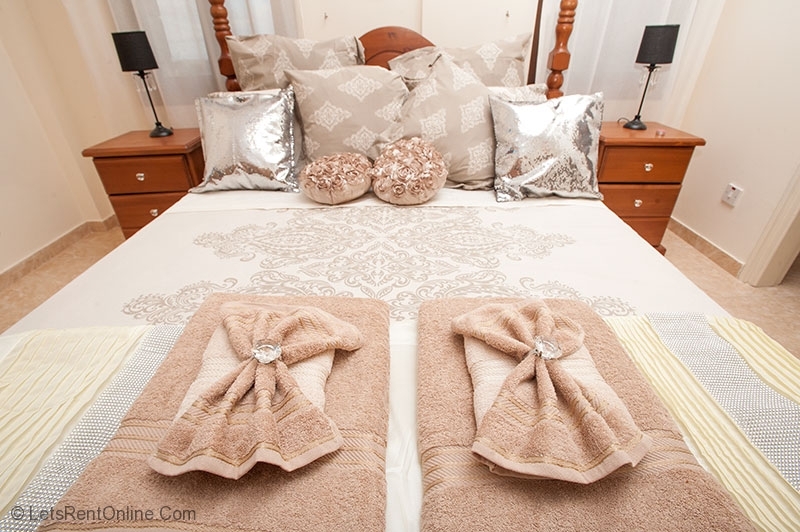 Upstairs is the master bedroom with it the four-poster king-sized bed with balcony affording wonderful views, a walk-in wardrobe and en-suite with Jacuzzi bath creating a luxurious feel which you'll love to unwind in. The third bedroom is a twin and also has access to the aforementioned balcony, as well as an en-suite shower room with double sized cubicle. 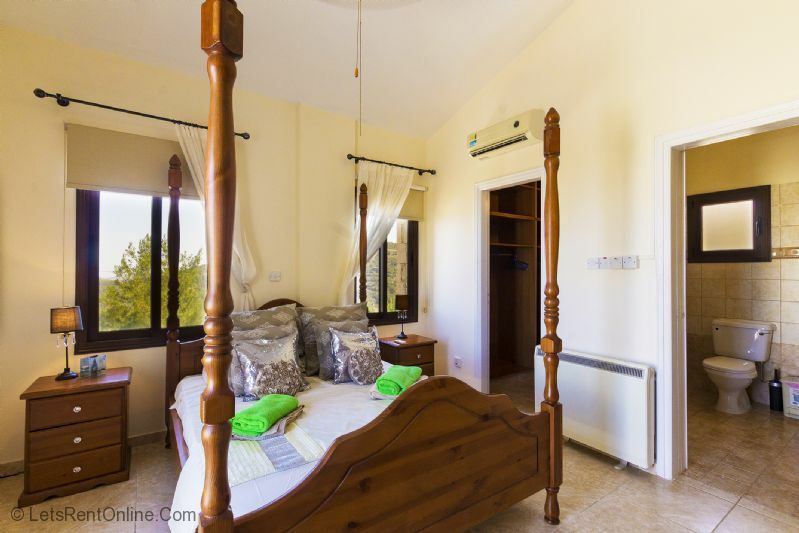 The villa is fully air-conditioned (included free of charge in bedrooms). Ceiling Fans have been fitted throughout for choice of comfort.The water is heated by solar panels on the roof. Central heating available (supplement of 30 euros per day (paid locally). A travel cot and highchair are supplied on request. Other extras such as hairdryer and pool towels are also provided. 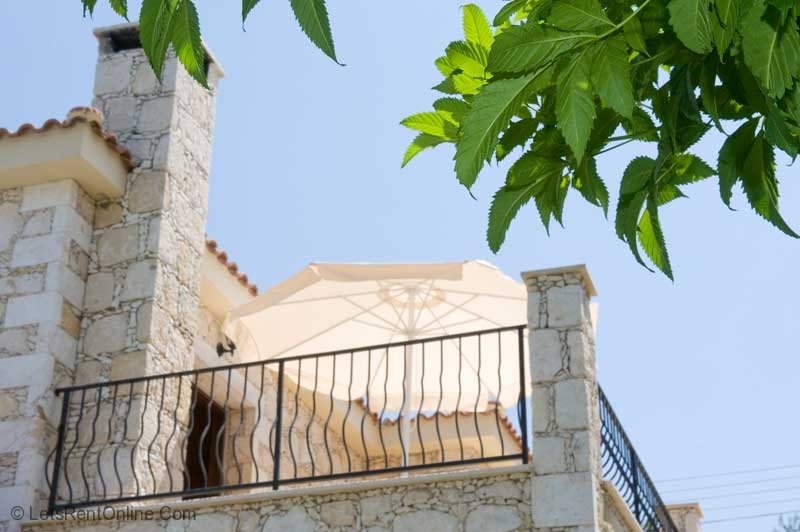 The grounds of Villa Agios Georgios in Lysos are accessed through an impressive set of electric gates that lead into the private driveway covered by a pergola with solid roof to help keep the car cool during hot periods. 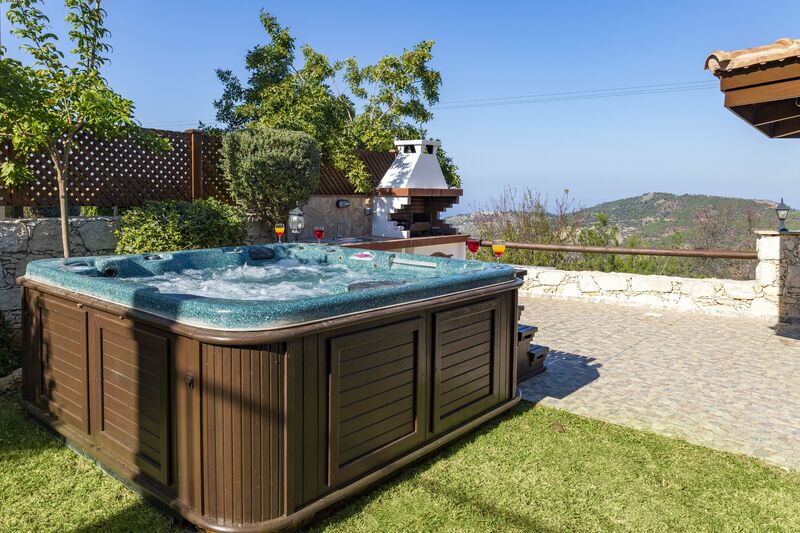 The stone built villa is complimented by a beautifully landscaped and fully enclosed garden featuring colourful flowers and grass lawn which allows you to relax and soak up the sun all day. The centrepiece of the holiday villa's grounds is a very inviting 8m x 4m private pool with ample room for sun loungers. Also on the pool terrace there is a table & chairs seating 6 under the smart wooden gazebo as well as as stone built bbq with sink and preparation area. 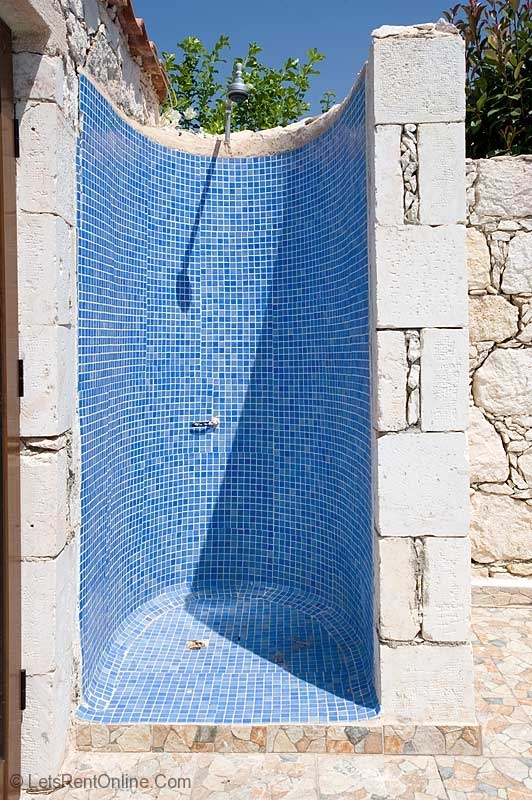 A useful and smartly designed pool shower make up the external areas. 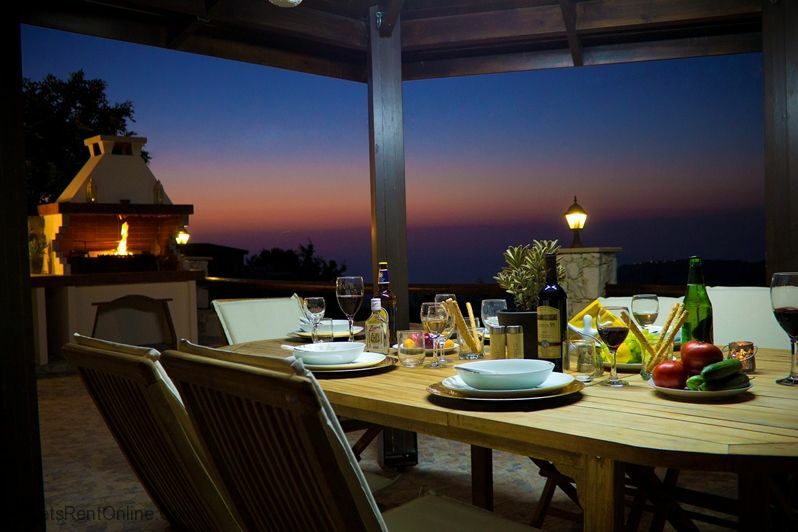 The enclosed garden has spectacular uninterrupted views of the surrounding valley, the Mediterranean Sea, Polis and Latchi, making it the ideal place for relaxing in the sun or shade, alfresco dining and socialising with your party on holiday. The villa is excellent. Very well equipped with 'benefits' that one would not necessarily expect e.g. 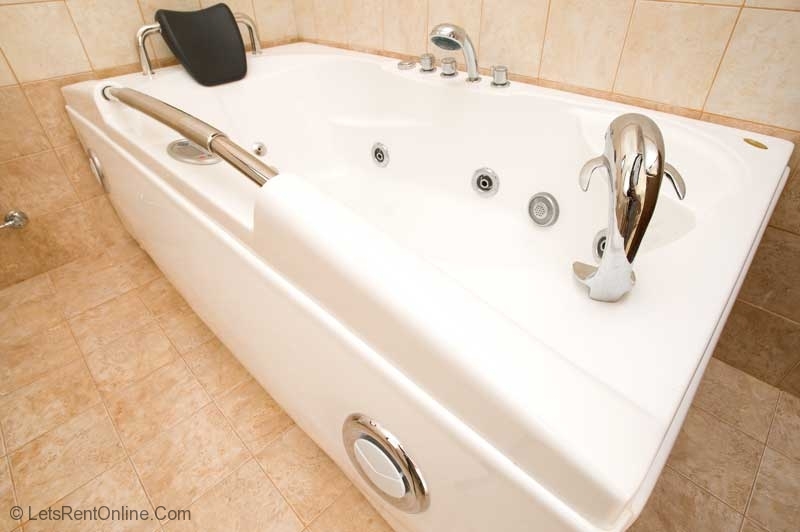 a whirlpool bath. 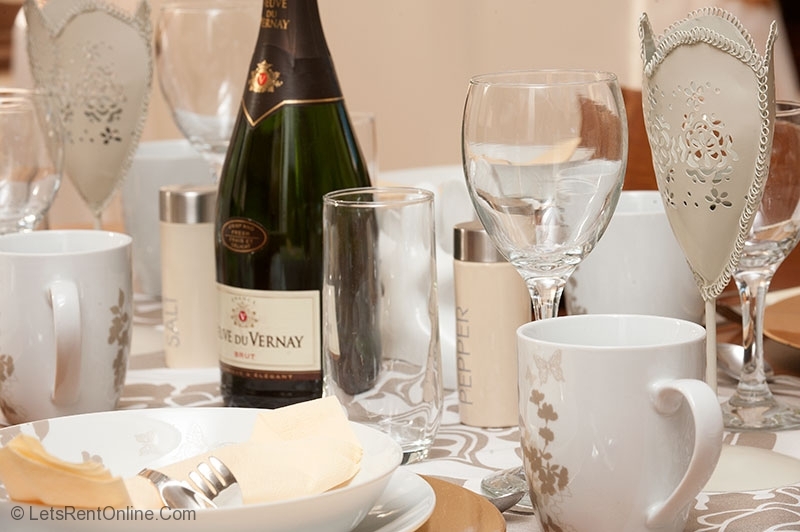 The location was superb - exactly what we prefer. 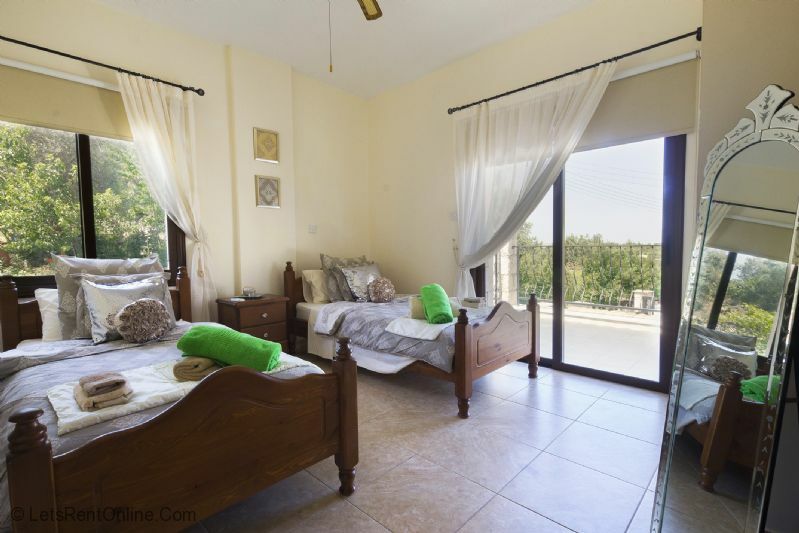 Not in a 'touristy' area, but in a beautiful quiet location adjacent to a traditional Cypriot village, yet accessible to a main town (Polis) with shops and restaurants. Polis itself was again, not too touristy. we liked it a lot. Privacy. 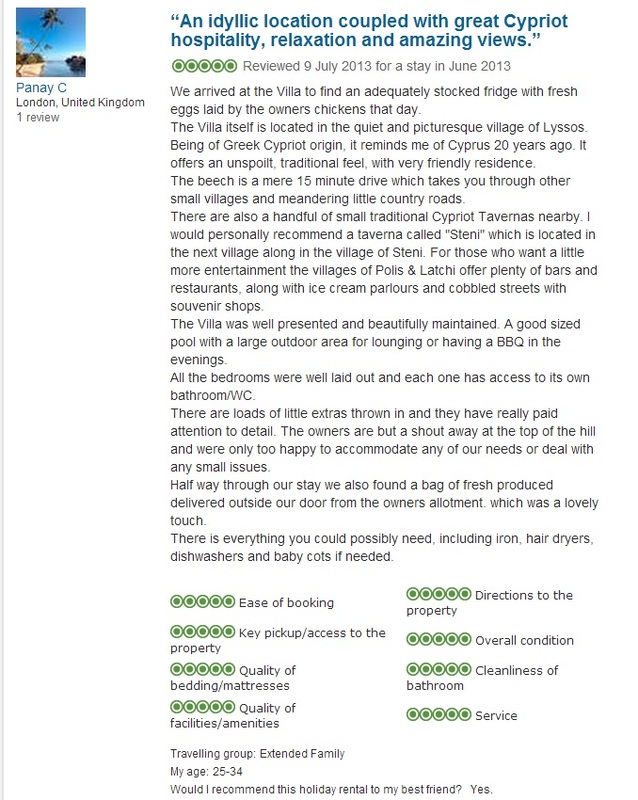 We discussed this by email before I booked, and you are correct that the villa has privacy - to some extent - so just a 'rider' for any future clients who may ask a similar question. We have always preferred to sunbathe and swim without clothes, but always conscious of local laws, culture and any adjacent folk. 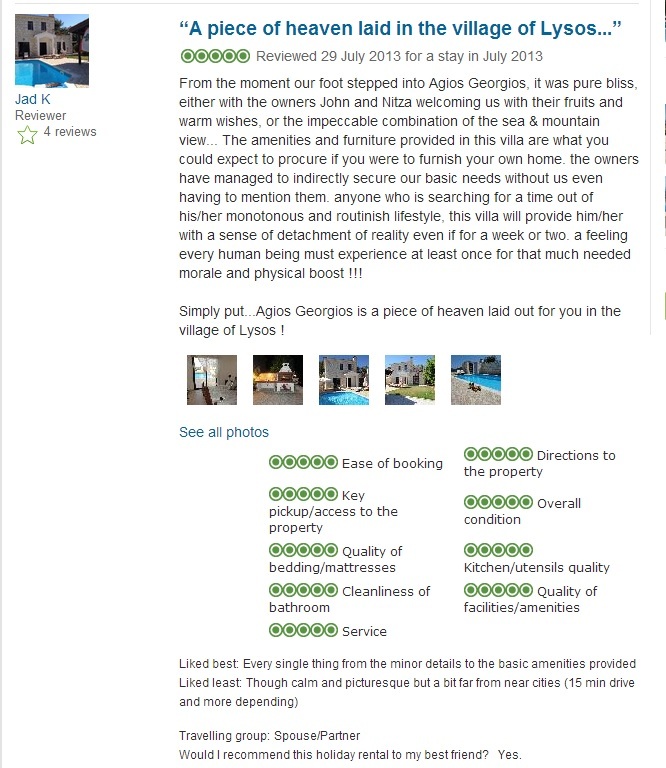 We were fortunate at Villa Georgios, in that there was nobody either side for our stay. Had there been, we would not have wanted anyone to be embarrased by our actions. So I just make the point as to the 'degree' of privacy available. 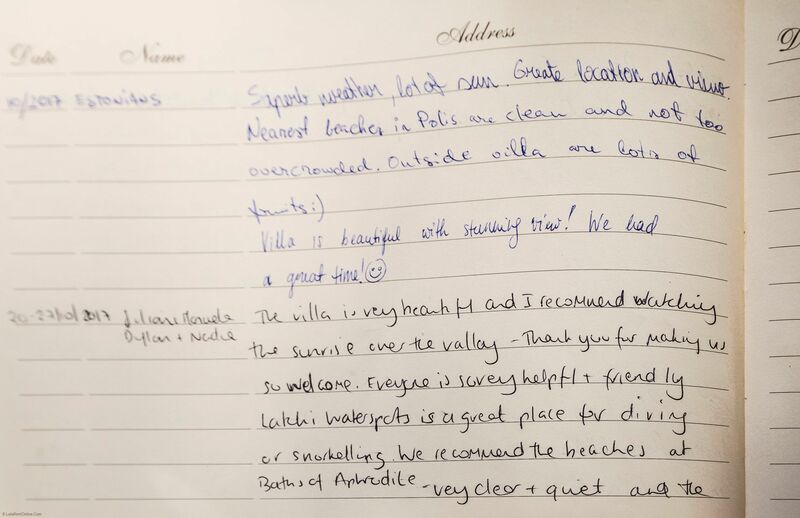 The only sightseeing we did was in our own hire car on a couple of very cloudy days (as one gets in the mountains) but there are a number of eating places we really enjoyed (and which we left a note of in our villa's Guest Book). In Polis, 'CHIX CHOX' was a very good restaurant serving excellent food - fish, meat and local specialities - with great service. For those who like Pizza, they make their own, but beware of the 'sizing'! The one time I had pizza, I ordered 'medium'; this equates to 'large' in the UK so I took a quarter of it home! But excellent quality. 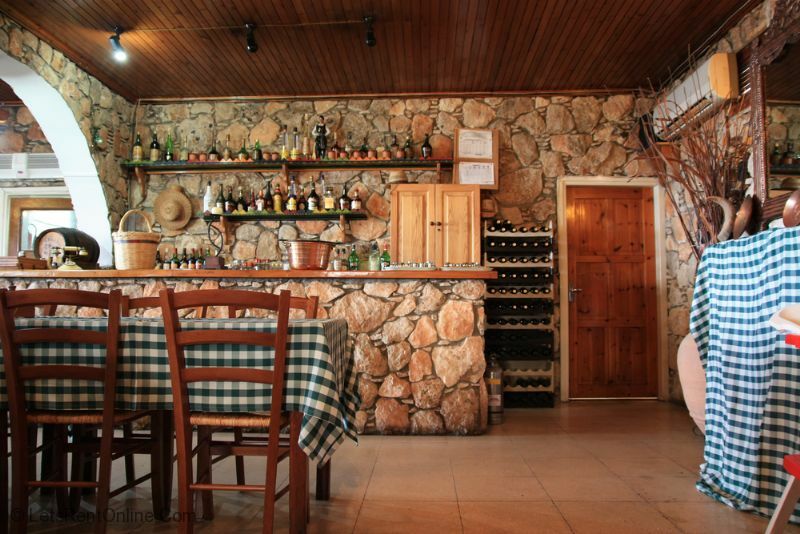 In ARGAKA we recommend COAST TAVERNA. Right across the road from the seashore. Great people, great food and great prices. I personally recomment 'ELIZABETH's STAMMAKI'! Really tasty (she gave me the recipe!) but beware, very filling. I was impressed with your service and your pro-active commitment and communication. 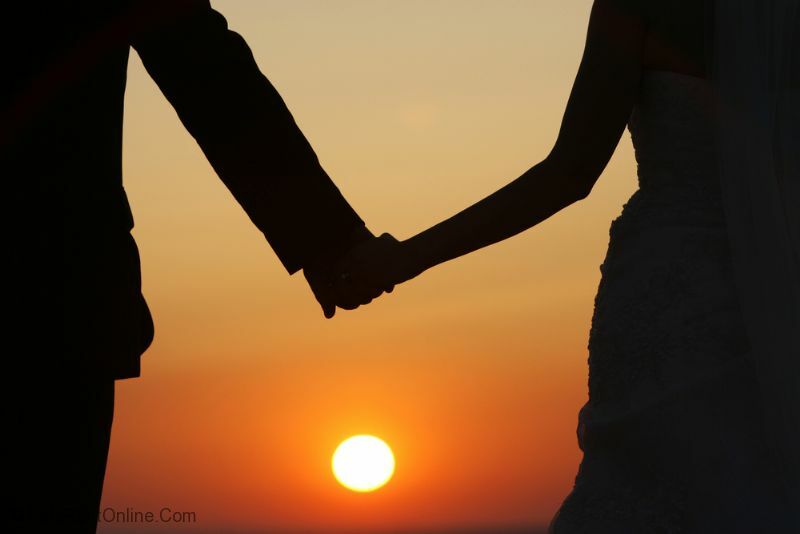 ''The villa was great very comfortable, better than we expected and beautiful to see sunrise. We liked the quietness of it all and nature. Latchi watersports were fab for diving. Marina for fish food. 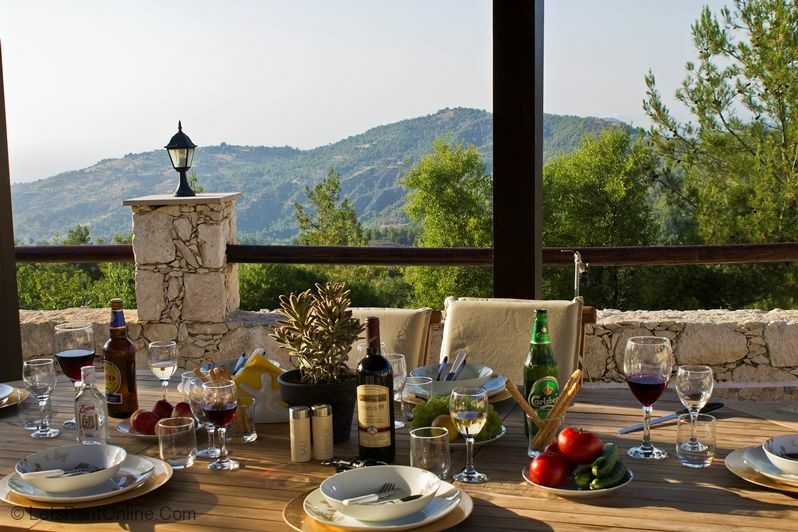 Panagkrotis in Millou fanmtastiuc for traditional food and taverna. 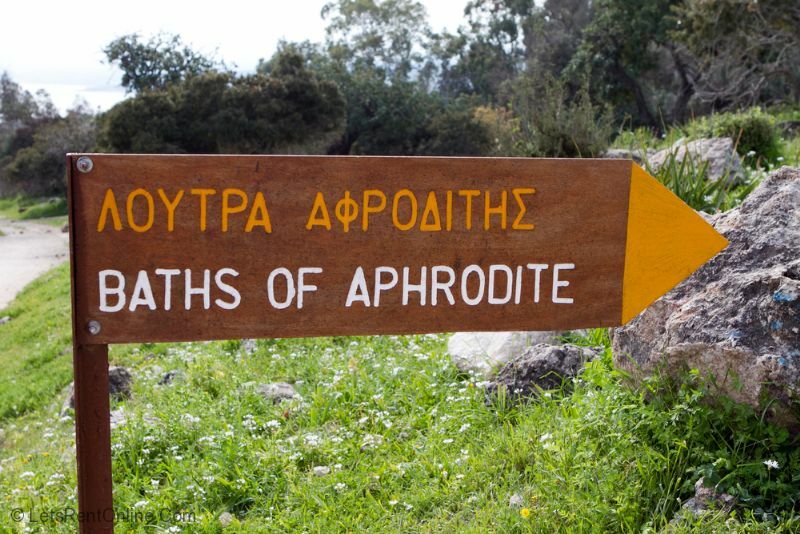 Baths of aphrodite for bathing. 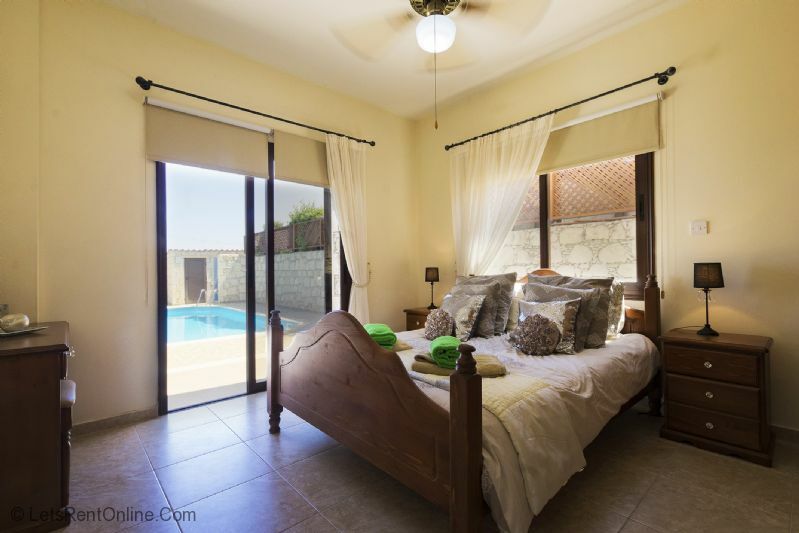 ''The villa was lovely with lots of space, well furnished. The outside area and the pool were amazing, with lots of room, seating and dining areas and stunning views of the coastline and lovely sunsets. We made good use of the large barbecue. The welcome pack left for us was substantial, the best we have ever had. Located a short walk into Coral Bay. 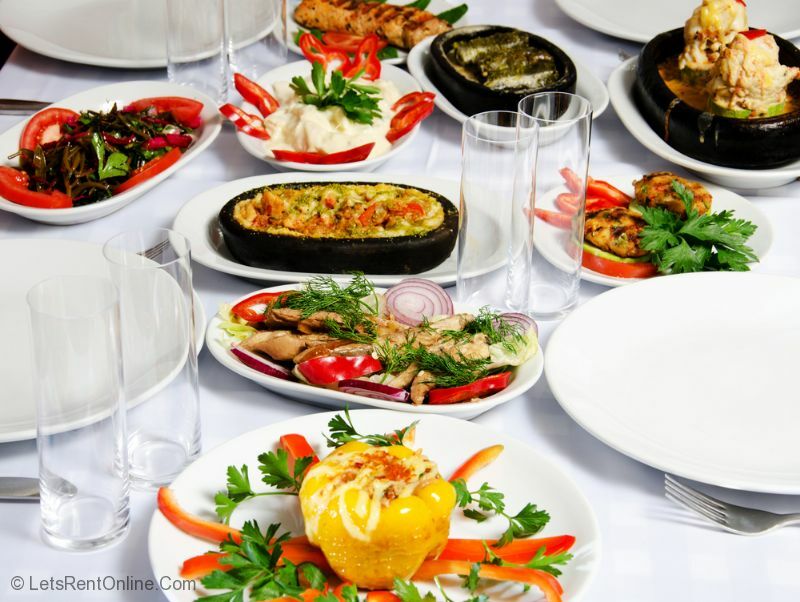 We would recommend eating at Coral King - A Greek restaurant with traditional entertainment including Greek dancing and smashing plates. We also had lovely meals at Seriani (Japanese) and Trattoria La Vigna. The service was excellent for booking through to returning home. Steven remained in touch throughout and was always prompt to respond to any questions that we had. He organised our taxi transfers to and from the airport. The owners called in to see us on the first day to check everything was ok and then returned after on week to clean the villa and change the bedding and towels. Fabulous, clean, big, well equipped, lovely homely feeling. A little bit remote, would definitely need a car, beautiful never the less. Views to Polis Harbour in the distance, peaceful and quiet. 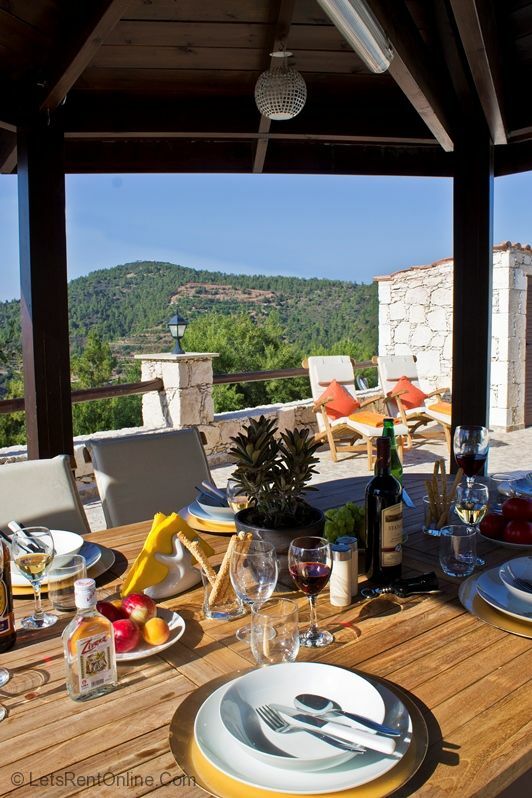 For some good local food, the restaurant and buffet at Paridisos Hills Hotels is great value for money, and literally minutes walk from the Villa. Great hospitality too. 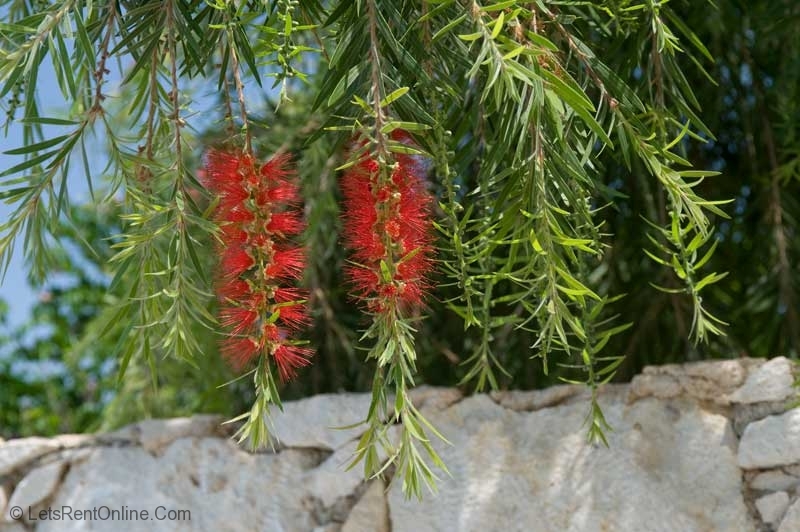 Drive to Polis, and eat at Arsinoe Fish Tavern (booking recommended) - fabulous fish restaurant, also along the same street there is a much bigger restaurant Moustakallis; within the village the Spice & Easy shop (Peristerona) is great to pick up spices, and some well being items. 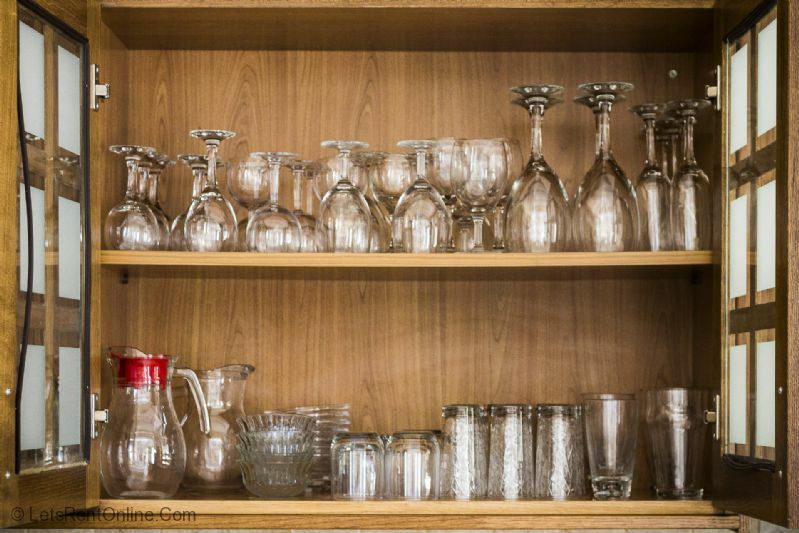 Catherine and Joe are great hosts, worth a visit. For a boat trip where you might not want disco music :) but a relaxed trip round some beautiful waters and have a swim with the fishes in the clear sea...would definitely recommend the Venus Sea Cruises - boat name Christ Adonis with Ahmed and Mohammed on board from Paphos - fantastic day out and great value for money. 100% satisfied with LetsRentOnline from the first day of booking to when we returned. 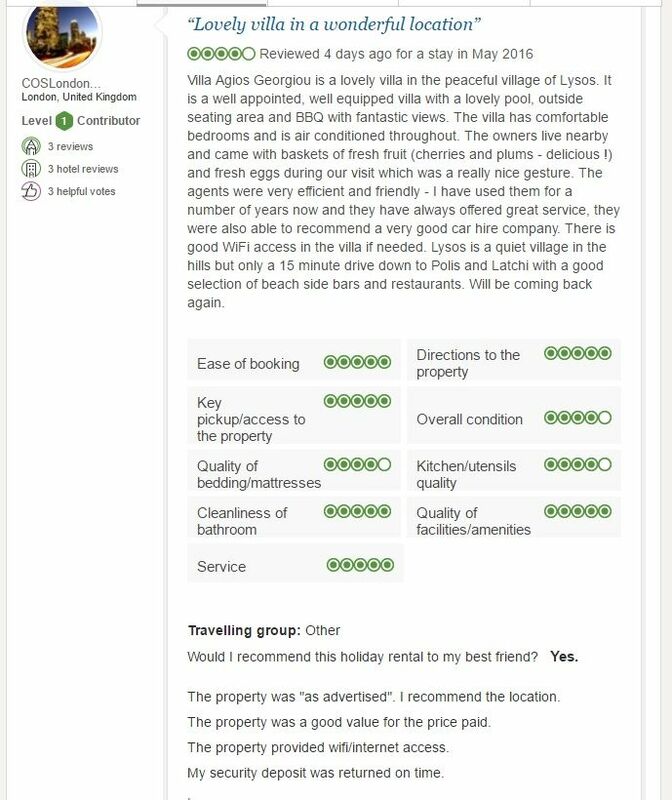 Excellent information about the Villa, directions and vouchers for use whilst on holiday.W ould definitely book again and have already started to recommend to friends. Everything was perfect. It was lovely to receive a very useful welcome pack on our arrival. 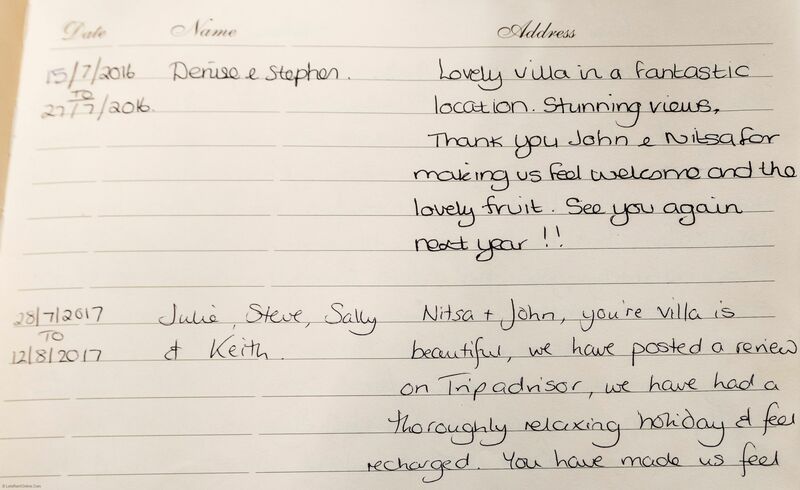 We will be back and we will definitely be booking with you again. 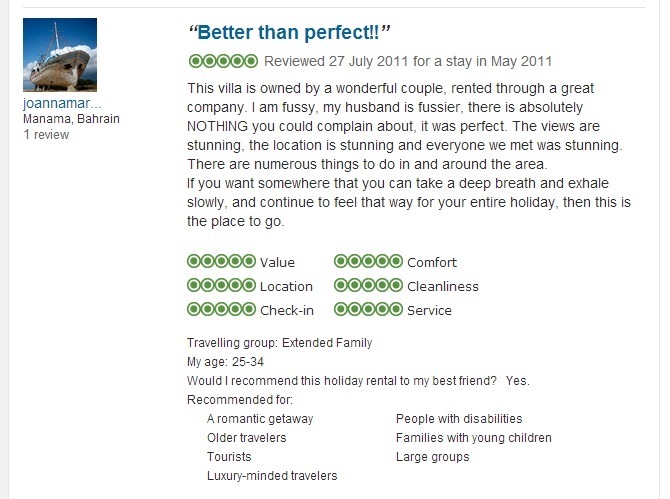 ''We had a fantastic holiday, thanks. 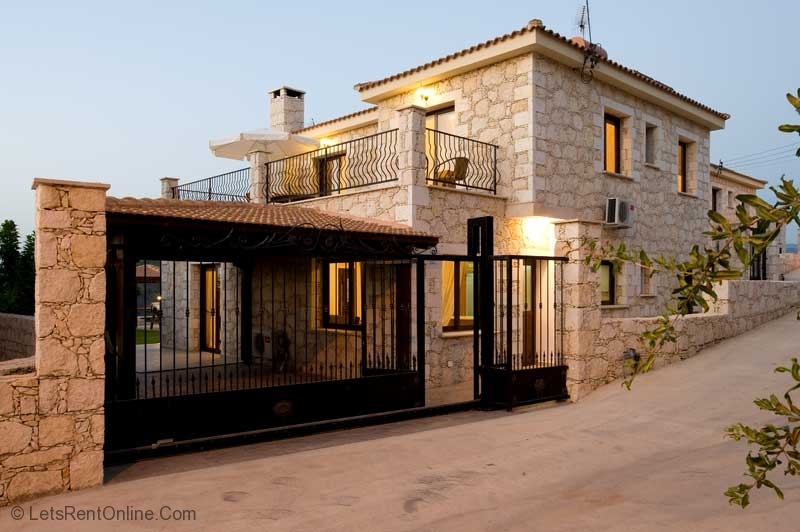 What a lovely villa! We left it as we found it, no breakages or damage at all, so I'm sure the owners will be fine. Fantastic, better even than we were expecting, really big and spacious (even if all four of us had gone as originally planned!) and very well equipped. The garden and pool were great, it was clean and tidy and a real taste of luxury. The pool was spotless and was cleaned two or three times during our week there. Beautifully peaceful location, which is just what we wanted. 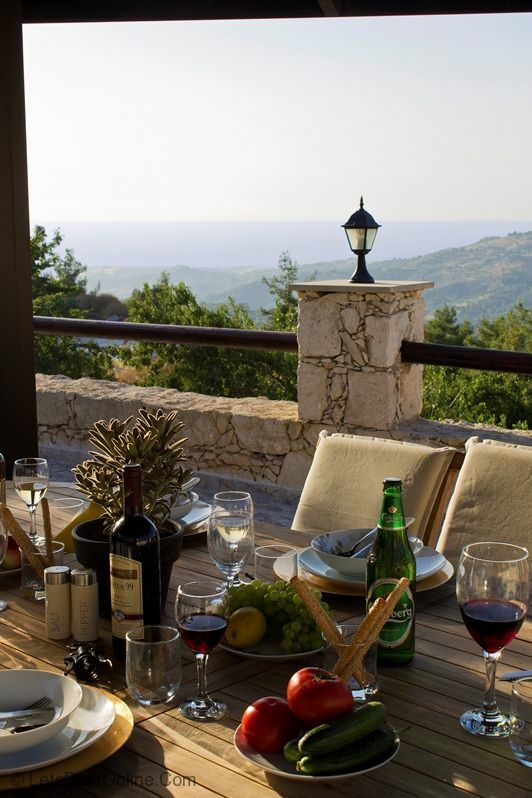 A car is really a necessity, unless you're happy to eat in the nearby hotel (Paradisos Hills, which we didn't try) or walk into Lysos for the couple of restaurants and cafes there. We spent a couple of days on Latsi beach, which we really enjoyed - warm sea, couple of bars for refreshments. We spent a couple of evenings in Polis, which has a great selection of restaurants and a brilliant atmosphere in the little square. We had a great meal in Moustakallis restaurant in Polis. But the best experience was a shave in the little traditional barbers! 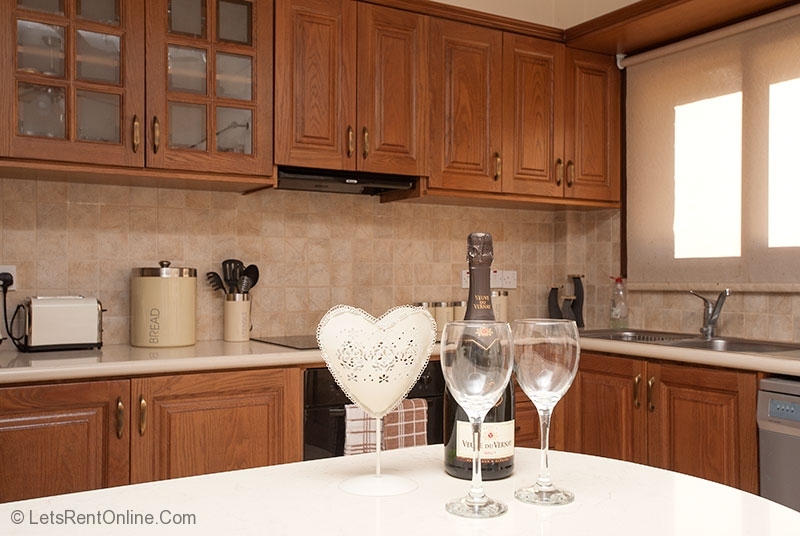 "The property was spacious, clean, modern and with good facilities. 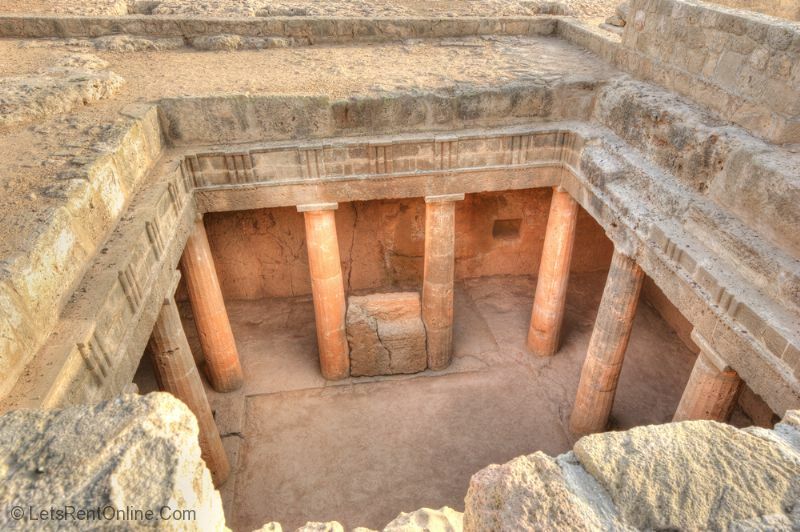 The location was quiet, picturesque and unspoilt but just a 10 minute drive from Polis town. The Old Town restaurant in Polis and the restaurant at the Paradisos Hills Hotel just across the road from the villa in Lysos were both great. 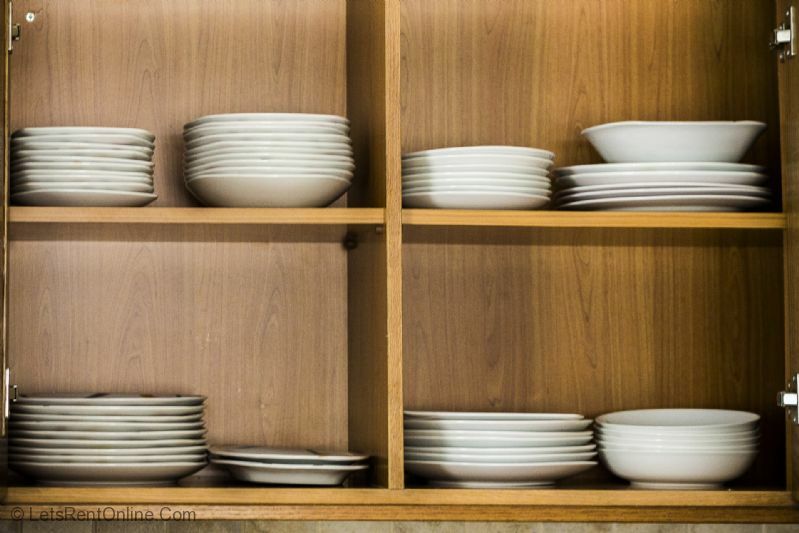 Your service has been very efficient friendly and helpful. Many thanks." 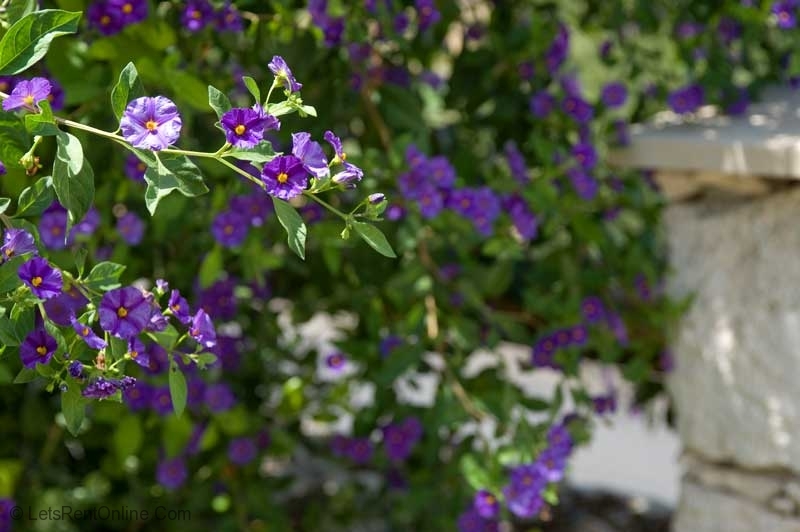 "Beautiful property, larger than it appears on the pics with all the comforts of home, there was nothing that we needed which want available to us, including a few bottles of water on arrival, a welcome touch after a long flight and drive.... The property looks brand new and was a spotlessly clean inside and out, the gardens well tended and the pool cleaned several times during our short stay. Amazing sums up the location. High in the hills, the views/scenery were amazing. From the garden you look out over forest and farm land with nothing other than a few houses right down to the sea in the distance. Roughly a 45 min drive from Paphos airport, the directions from letsrentonline.com were really helpful, and we found it in the dark without a problem (surprisingly). Its pretty remote, but in a good way! Although there are a couple of neighbours we didn't really hear a peep from them and other than a few cars during the day it was silence, which was just what I wanted. Polis is about 25 mins away for the supermarkets, after stocking up there wasn't much reason to leave.? Savvas Taverna in Polis was great - We went here a few years ago and made a point of visiting again. I've never had such a warm welcome. 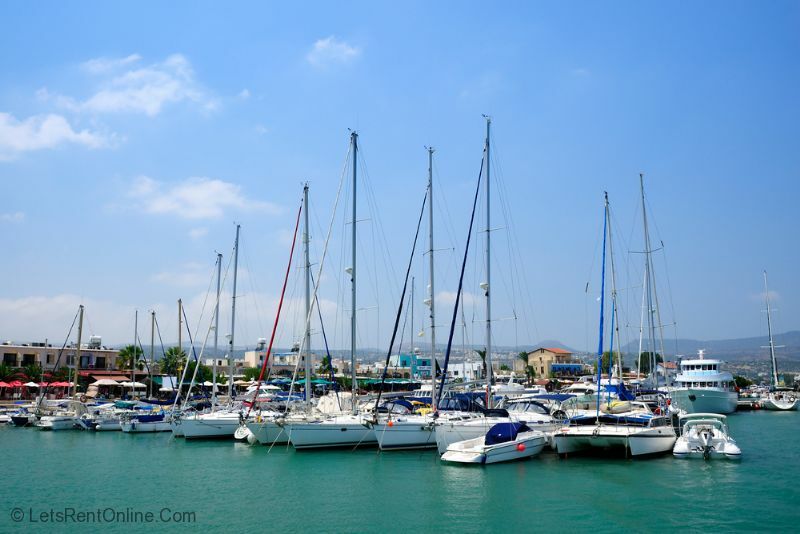 If heading into Paphos harbour, The Gourmet Taverna is worth a visit. The owners are lovely people. Our flight home wasn't until 10pm so the 11am 'check out' wasn't the best for us, but a quick call to Nitsa in the morning and she agreed we could leave at 4pm.. That gave us another day to float in the pool and meant we didn't have to drive around all day with suitcases in the car. This was only possible because they didn't have new guests that day obviously. 10/10 for Service, communication & info. All met expectations. Couldn't ask for more." "'Thank you for the e-mail. 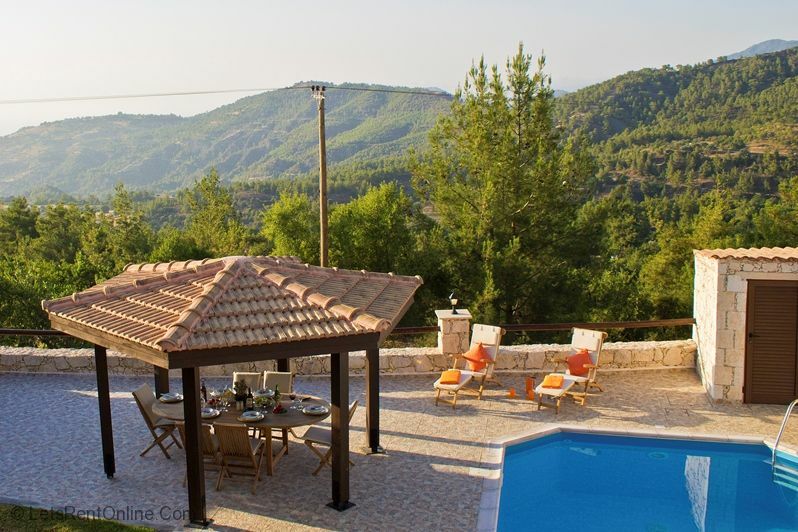 The villa was fantastic, the views sublime and the overall holiday just wonderful. 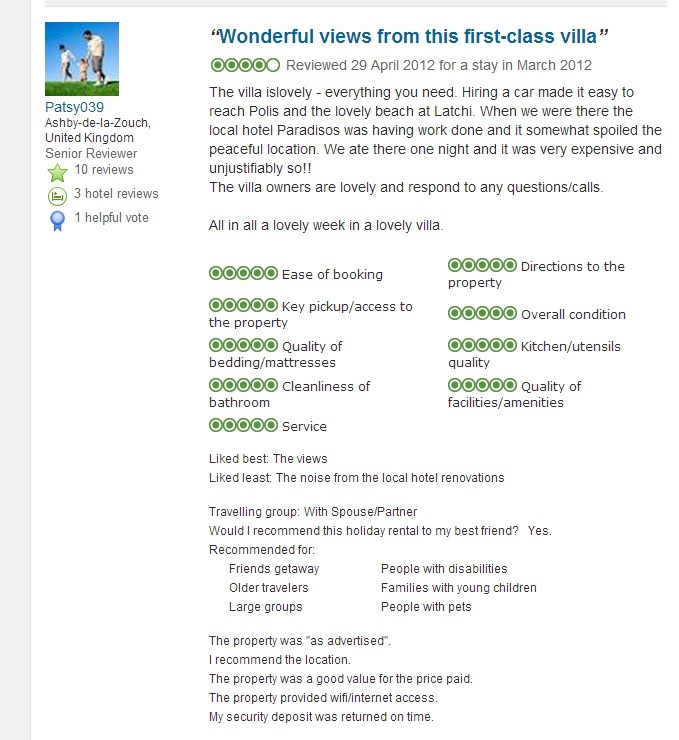 The voucher is much appreciated as we will be looking to stay at the same villa again some time next year. Once again, thank you very much. i will recommend your services and properties without hesitation. 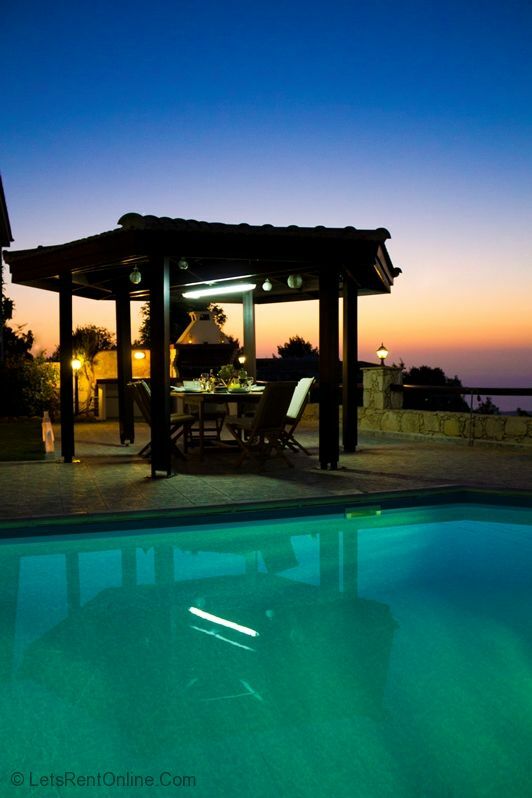 Kind Regards, Joanna Maric"
Lysos is a traditional mountain village in Paphos District, Cyprus. 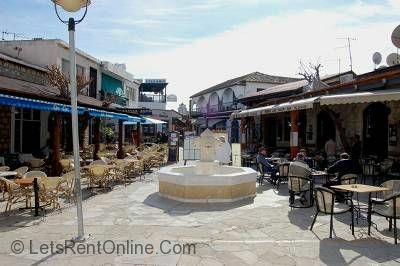 It's a picturesque mountain village famous for its efforts to maintain the beauty and the traditions of Cyprus. 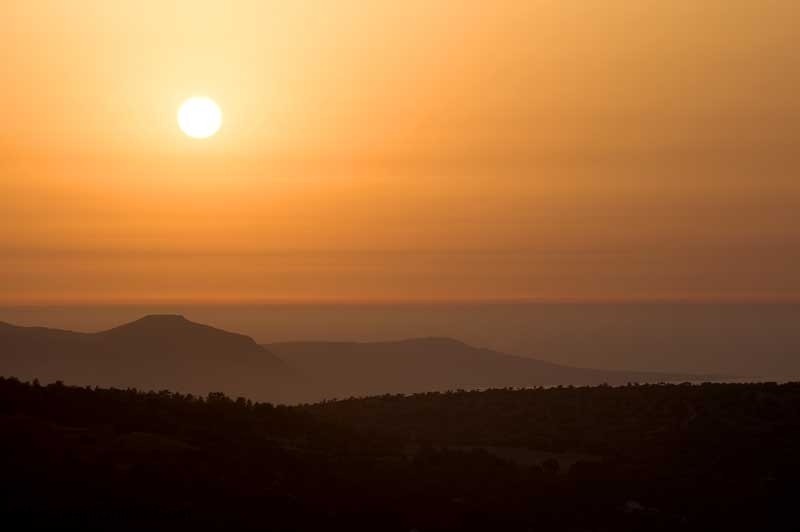 At just under 500 metres above sea level the summers are a few degrees cooler than the fierce summer temperatures in the coastal towns, the air is less humid and there's usually a gentle mountain breeze. In various locations around Lysos there are many remarkable landmark churches. Ayios Georgios was built in the 13th century where frescoes of Saint Mama can be found and it's still protected by the antiquities department. Churches such as Panayia Chryselousa constructed at the end of the 15th century with Byzantine and Gothic elements, Profitis Elias, Ayios Constantinos, Ayios Charalambos and the country church of Archangel Michael provide for a unique perspective of the village history. With an abundance of natural water Lysos was used in Cyprus as an industrial area for the melting of metals. The fountain located by the church and built in the 1900's was made entirely of stone including the five taps of which were used to supply fresh drinking water. 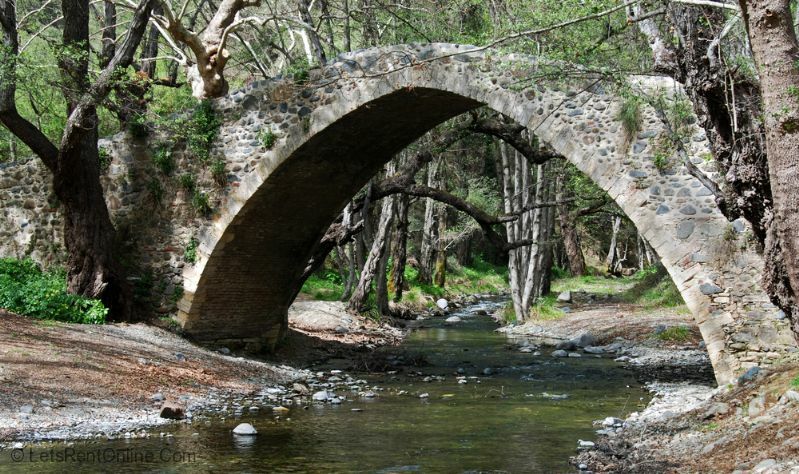 Lysos is situated between the crystal clear waters of the Mediterranean Sea and the spectacular mountains of Paphos Forest and the Troodos. Walking in the forests is a delight. 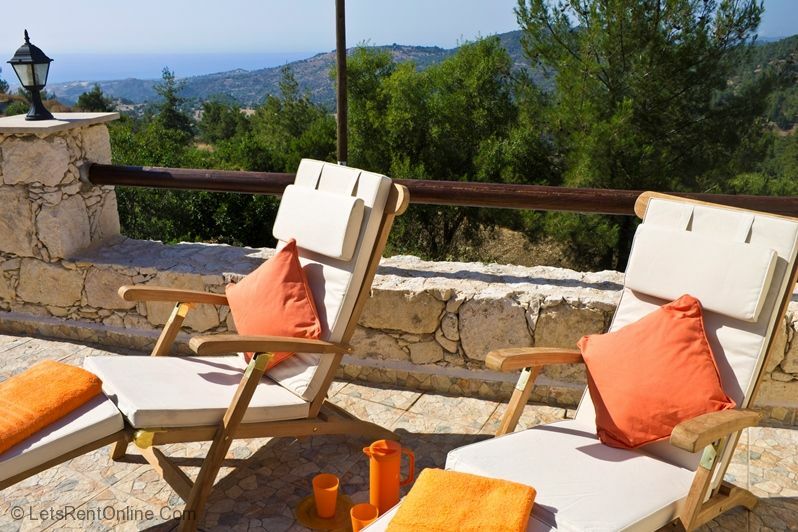 Filled with pine trees, fruit and olive trees, wild flowers and herbs and vineyards the air is scented and the views spectacular. 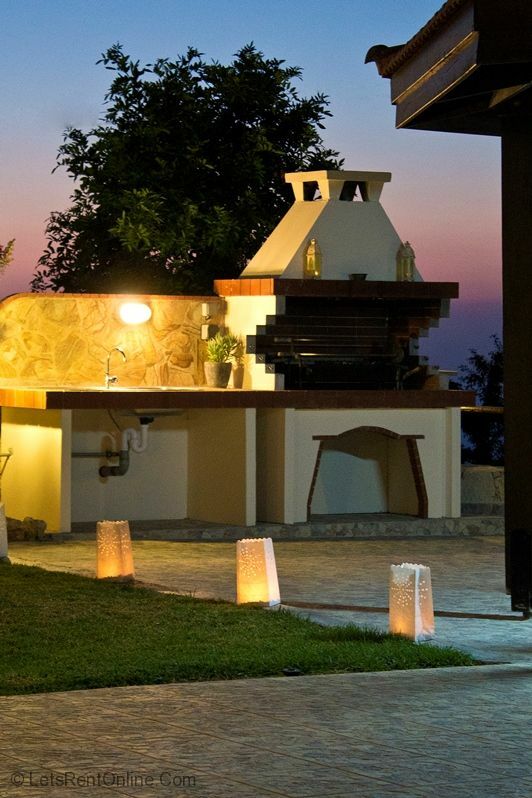 Lysos is home to a very good traditional Cyprus taverna, with neighbouring shops and the more widely known Paradisos Hills Hotel (50m away from Villa Agios Georgios). 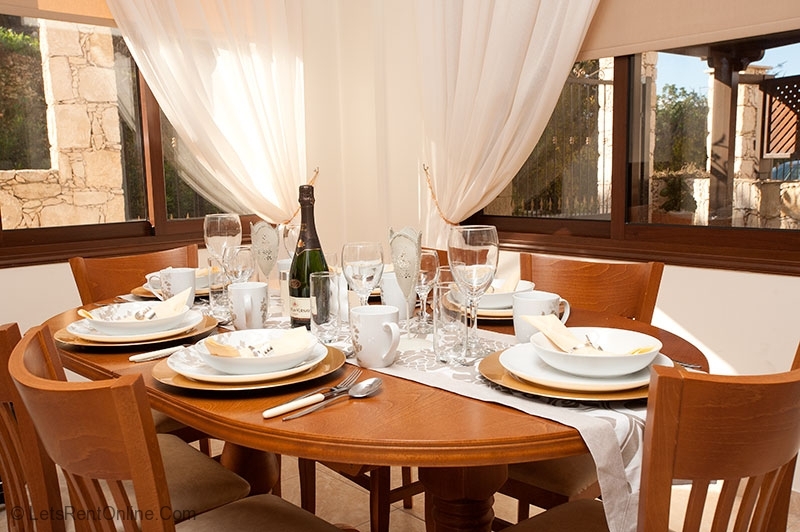 The Paradisos Hills Hotel is a small intimate hotel with only 15 rooms and a restaurant open for breakfast, lunch and dinner serving only the finest traditional Cyprus and International cuisine. Most of the food is locally sourced and much of it is organic and the Sunday buffet lunches are now known throughout Cyprus. 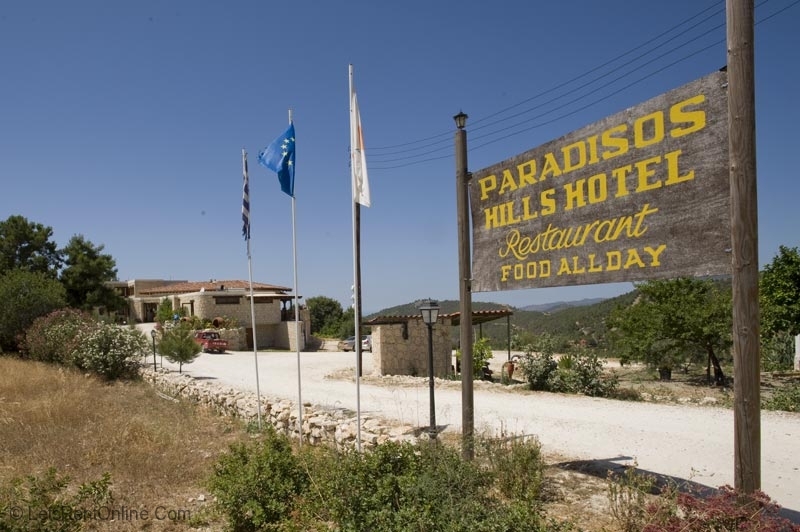 The Paradisos Hills Hotel also has international evenings where guests and regular customers can experience something different and test the full range of its gastronomic skills. Travel a little way passing the pretty village of Peristerona and you reach the small town of Polis. 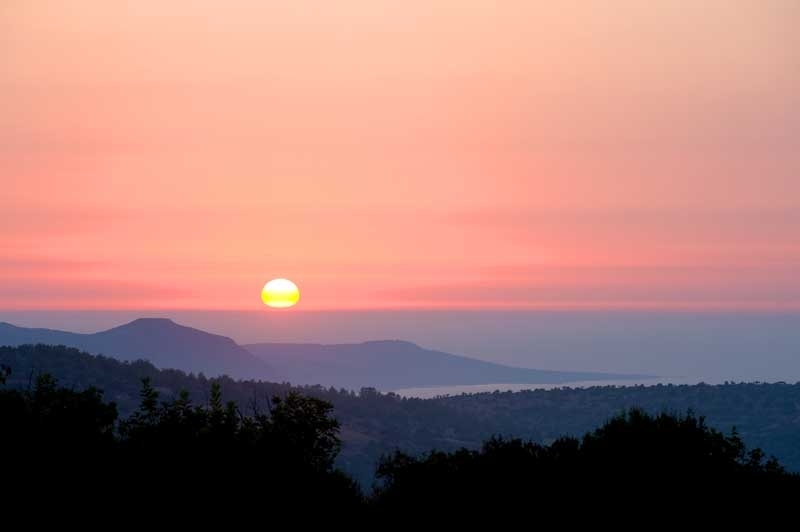 There is plenty of activity to choose from in Polis, whether you wish to dine in one of the many good quality restaurants, have a coffee or lunch in the central square, hire mountain bikes, quad bikes or maybe even a boat! The nearby Latchi beach is renowned as one of the best in Cyprus and not as crowded as the beaches in and around Paphos itself. Latchi beach is famous for its clear blue sea, soft white sand and a great selection of watersports which are readily available. The watersports available at Latchi include diving, snorkelling, sailing, banana rides and a great deal more. Bring your UK driving licence and you can even hire a boat and explore the Akamas coast from the sea. Drop anchor when you feel like it and swim or snorkel in the warm crystal blue water of the Mediterranean Sea. Don't fancy being the captain? Take a boat ride to the 'Blue Lagoon', swim or snorkel in the sea, then come back to the pretty harbour at Latchi to eat. Try the famous 'Fish Meze' where you'll be served around 20 dishes including some of the freshest catches of the day whilst watching the world go by. 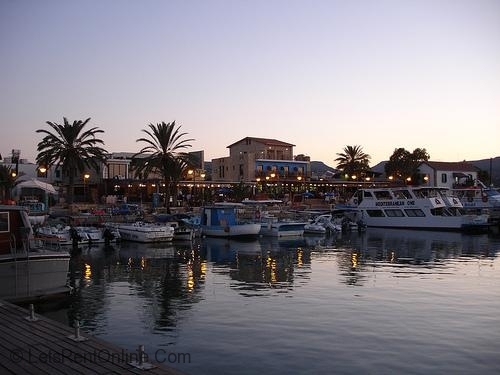 The harbour at Latchi is perfect to while away some time people watching.Some of the best horse riding in Cyprus is also on the doorstep in Lysos. 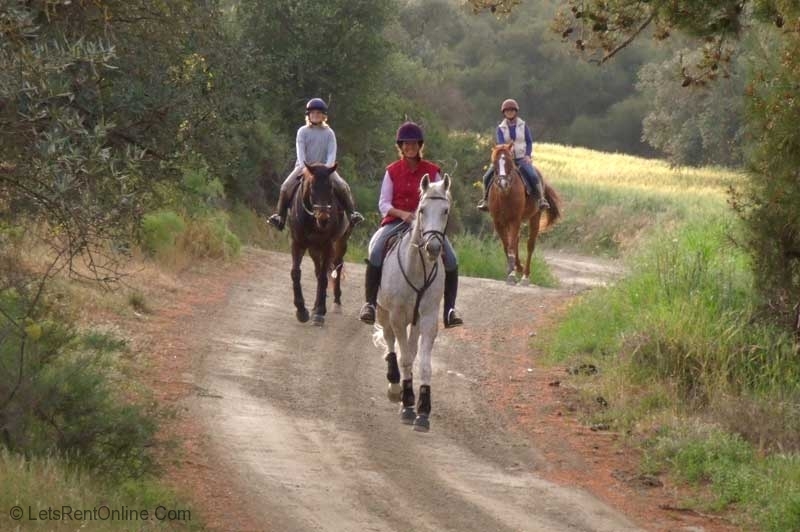 Further info here: Horse Riding in Paphos, Cyprus. Clay Pigeon Shooting is also now available in Lysos and represents great value for money. 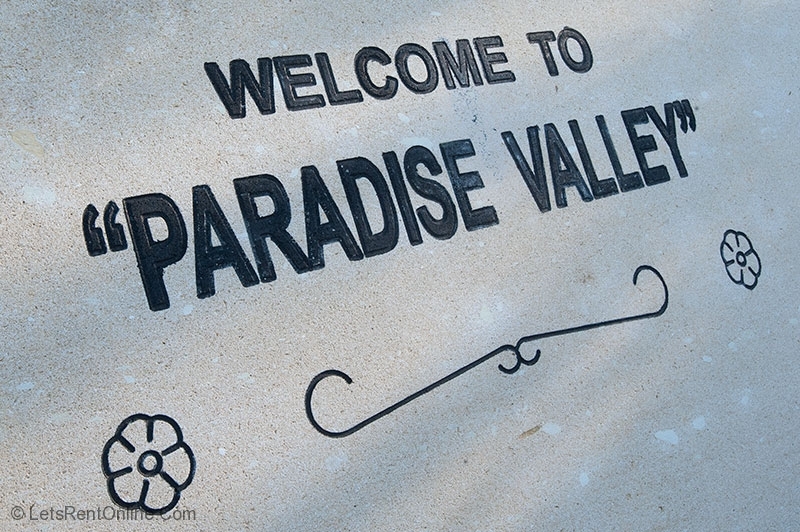 The owner is more than happy to take people there and get them started. 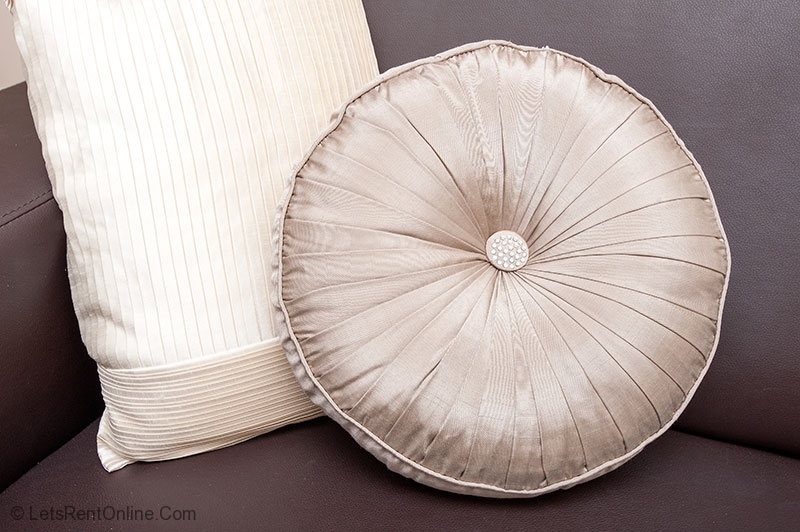 Please click here further details. 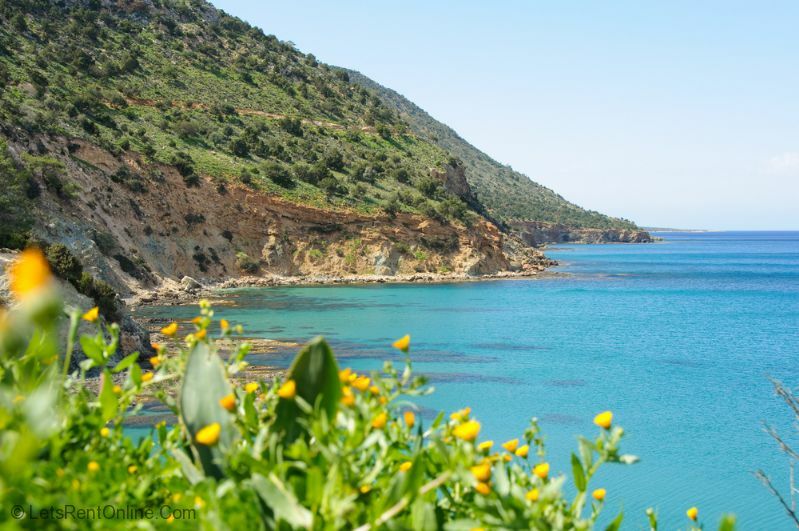 For the more adventurous, you can explore the Akamas nature reserve and go all the way round to Lara Beach famous for its turtles and wonderful beach. 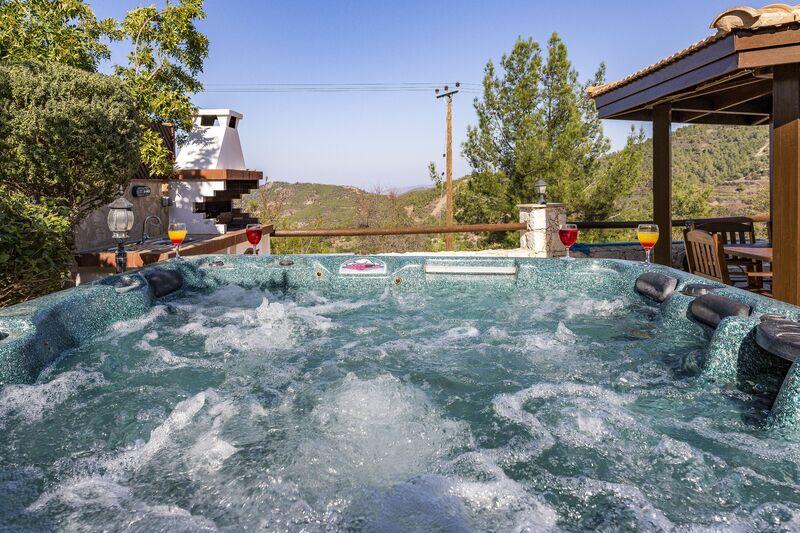 You can also venture to the nearby villages of Miliou, Droushia and Panagia or further on to Kathikas with its vineyards and wineries.Other fantastic scenery can be taken in at Cedar Valley and the Troodos mountain range where in Winter, you can even ski! 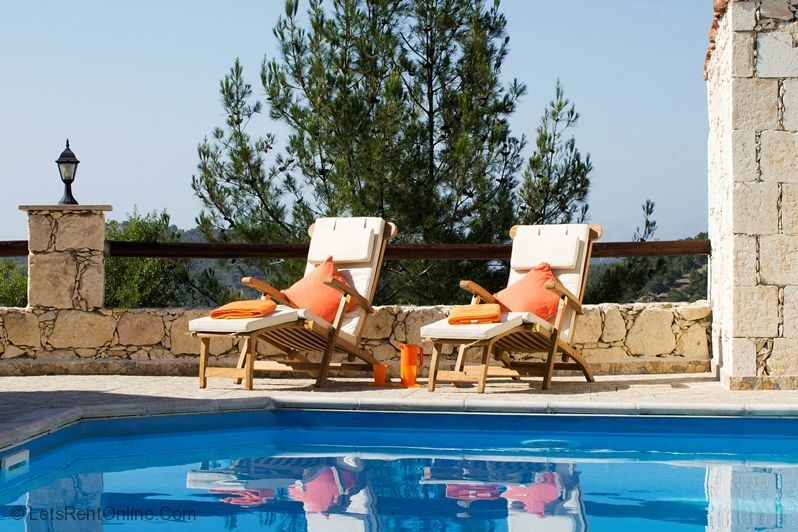 If you want to experience unspoilt Cyprus, Lysos is a great place to stay, all just a short drive from Paphos Airport. Central heating available (supplement of 25 euros per day (paid locally). Central heating available (supplement of 30 euros per day (paid locally).